“Witchcraft“, a 1902 wooden sailing vessel berthed for the night at Herrington Harbour Marina. It’s a work of art and history. There is a video on the yacht’s website which shows you how little room you get in a 52 foot wooden yacht! 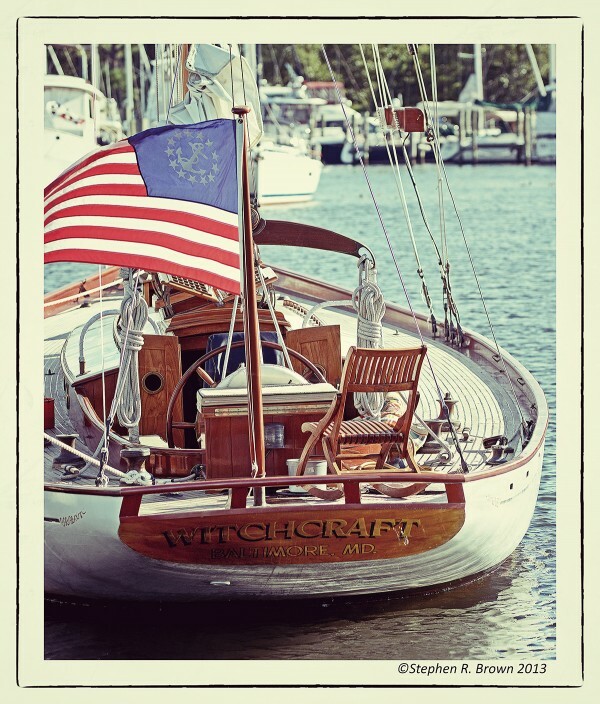 The wooden rocking chair on the stern is just the perfect touch! Both on the Mall and on the Bay, it’s been a really lovely season for photography. I just purchased three new D-SLR cameras and am astonished by the technical improvements made in cameras since I last bought three cameras which actually didn’t seem that long ago. These new cameras can be operated from my iphone, wirelessly transmit images to my computer, etc. and since they can be operated remotely, will have a place in making phtographs on the National Mall. August 10, 2013 | Filed under About the Book, Blogs, Books, Photography, Tidewater and tagged with Chesapeake Bay, Environment, Estuary, family, fishing, John Smith Trail, National Park Service, Oxford.